Since the opening of the Caledonian Canal “An Canal Cailleannach” in 1822, tourists have been coming to Fort William and the numbers grew after the arrival of the railway in 1894. Known as An Gearasdan in Gaelic, or “the Garrison” Fort William is the capital of Lochaber and is today the largest town in the Scottish Highlands. Fort William was previously Clan Cameron country. The town grew up as a settlement next to a fort that was constructed to control the population after Oliver Cromwell’s invasion during the English Civil War and then to suppress the famous Jacobite uprisings. Fort William has had many reincarnations. Originally, “Fort William” was named after William of Orange. The settlement was later renamed “Gordonsburgh”, then “Duncansburg” and then renamed “Fort William” again, but this time after Prince William, Duke of Cumberland. 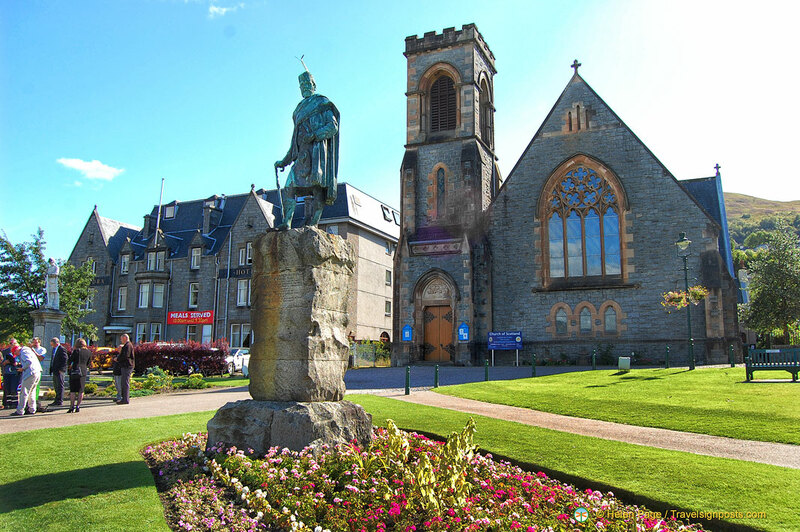 Today, Fort William is a major resort town of the Highlands and the centre of outdoor sporting activities. It markets itself as the “Outdoor Capital of the UK” and its not hard to see why. With its close proximity to Ben Nevis, it is a base for hill walkers and climbers who come to take on the highest mountain in the British Isles. Fort William is also the northern end of the 153 kilometres West Highland Way trail through the Scottish Highlands to Milngavie, north of Glasgow and the starting point for the 117 kilometres Great Glen Way. There are also many cyling tracks in the region and the Downhill Mountain Bike Track brings international competitors to its annual world championship. Fort Willilam is also the home of the Scottish Six Day Motorcyle Trial, an international event that has been running since 1909. But Fort William is not a town that’s solely for the super-active (see Note below*). The town is a popular stop for coach tours of the Scottish Highlands and many, like us, arrive in comfortable coaches. The pedestrianized High Street is the centre of the town’s commercial life and here you’ll find all the retail shops, a wide range of accommodation and the town’s essential services. The many food outlets and shops along the High Street make it a convenient place to stop for lunch or a mid-morning stretch. Attractions within the town include the West Highland Museum with its large collection of Jacobite memorabilia and the visitor centre at the Ben Nevis Distillery. Apart from sitting in the shadow of the mighty Ben Nevis, Fort William also enjoys a dramatic setting on the shores of Loch Linnhe beside the mouth of the rivers Nevis and Lochy. For those with a little more time, you can head along past the west end car park to the beautiful loch-side gardens. This is a great place to watch wildlife and unforgettable sunsets. Also, it’s possible to take a ferry trip on Loch Linnhe “An Linne Dhubh” for the best views of Ben Nevis “Beinn Nibheis”. The West Highland Line, a scenic railway between Mallaig and Glasgow, passes through Fort William. And if you’re thinking of arriving here by bus, it seems that Fort William is one of the few remaining towns where the horse and cart is a faster mode of transport than the bus service! Search and book Fort William hotels and read hotel reviews Here. *Note: For travellers with a mobility problem, Shopmobility Lochaber provides a free hire service of wheelchairs, powerchairs and electric ride on scooters to anyone with either a temporary or permanent mobility problem. The electric scooters will certainly help in getting around and seeing more of what Lochaber has to offer. Shopmobility is a charity and relies on businesses and client donations to operate this fantastic service. For more information on where to find them and how to use their service, check out their website www.shopmobilitylochaber.co.uk. Thank you Julie, website link has been updated.